I saw the latest installment in the Hunger Games series twice this week and I have been feeling inspired ever since. Sometimes I just really want to spend all my time designing, knitting and sewing crazy costumes. All the designers on these films must have a blast! I've been sketching knitted things inspired by the different costume pieces and characters in this movie all week. For the most part I've knitted simple accessories, but this has me wanting to branch out and try designing some "couture" items. It's been more than a year since I read the book, so I had forgotten that the first part of the story is set in the Winter. That meant we got lots of fabulous chunky knitted things. 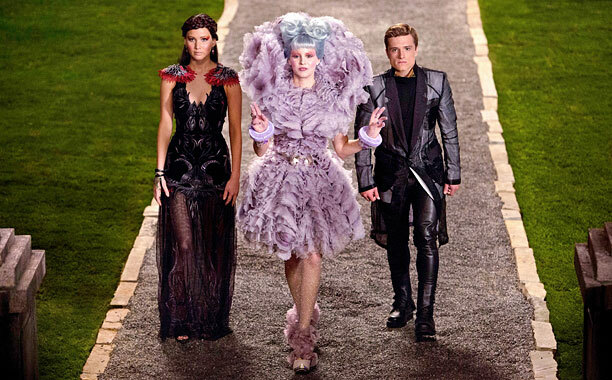 The costumes reflected the fact that the main characters have some money to spend now, and you could tell there was style influence coming from the Capitol, while still fitting in with District 12. 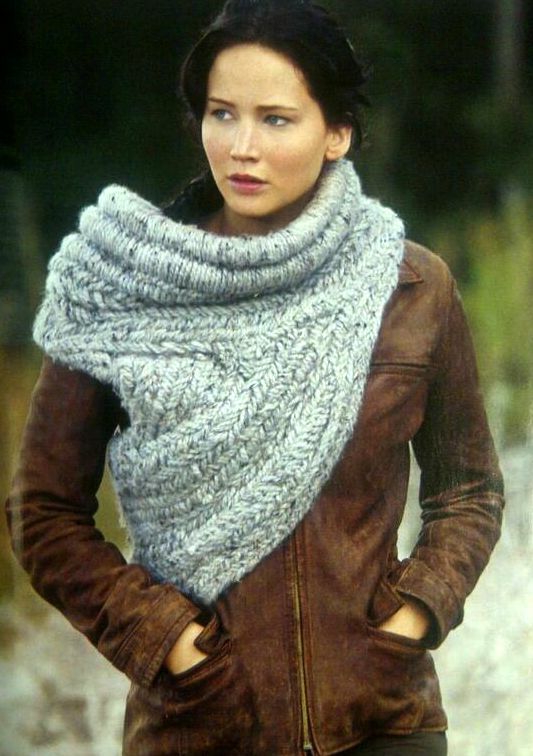 I'm obsessed with this wonderful cowl/scarf/vest. I was trying so hard to figure out how to make one that I probably missed most of the first 10 minutes of the movie. I can't find any good pictures, but the back is really cool too. I've found a few copycat patterns online, but none of them really do it justice. On the Victor's Tour. 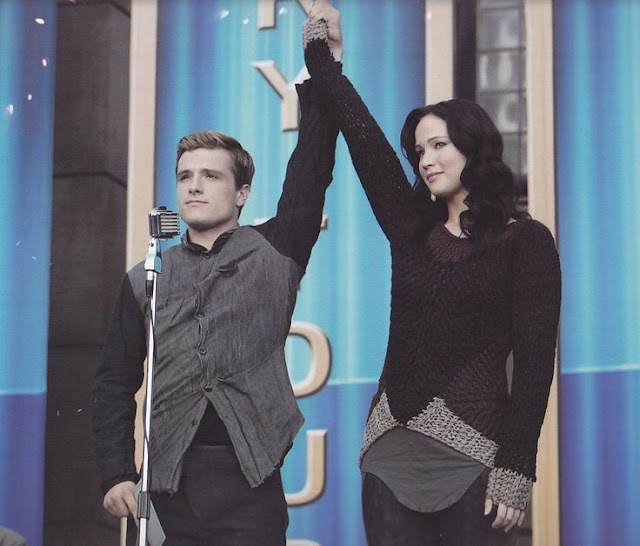 I love the pieced-together textured sweaters Katniss wears. I think this one is crocheted. Unfortunately we never got a better look at this sleeveless sweater Katniss sleeps in on the train. So many great textures! Can we all just take a moment to appreciate Stanley Tucci in this film? Oscar nomination please! 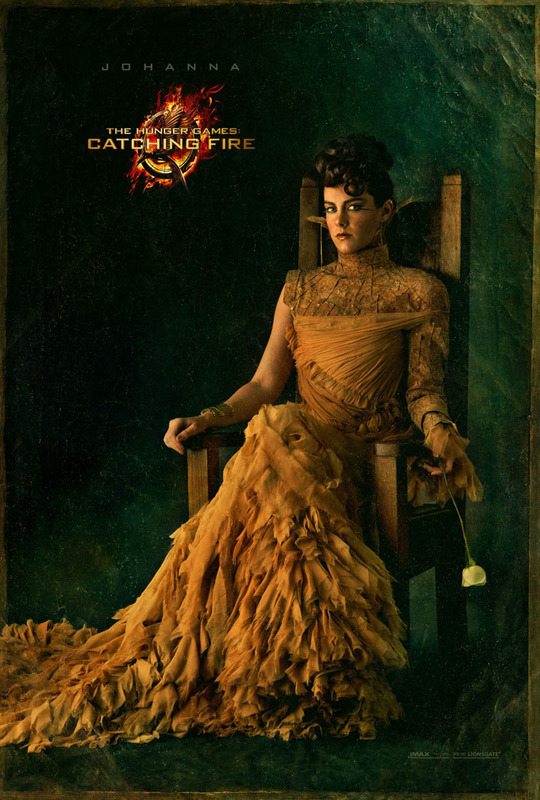 Effie's reaping dress covered in butterflies was stunning. I loved Johanna's whole interview look, especially those scary eyelashes! Unfortunately I'm pretty booked with Christmas knitting and crafts right now, so I won't have time to make any Catching Fire knits for a while, but I'll be sure to share when I do. 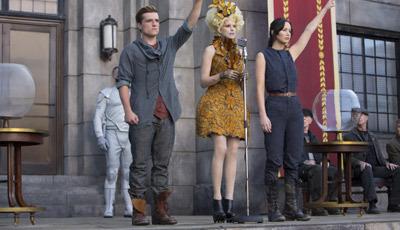 This isn't the first Hunger Games movie to get me feeling creative! You can see the makeup and nails I tried out last year here. What are you inspired by right now? What were your favorite design elements in Catching Fire? I loooooooooove the cowl, too! I think it would annoy me if I actually wore it, though. Her pieced together sweater IS something I would wear....looks cooooooooozy. Haha, I got stuff to try making a cowl and I have a feeling it's going to end up being one of those knitting projects that I had a lot of fun making but never use! And yes, that sweater looks amazing!